Apple (s aapl) is gearing up to launch its Mac App Store sometime between now and the end of January. Preview screenshots suggest that Apple’s iWork apps will be among the first available for purchase in the new software marketplace. iWork is great, but I’d like to see a more modest offering: Notes.app. Notes has come a long way since its introduction, due entirely to only two feature changes. The first was the introduction of the ability to choose from two other font options: Chalkboard and Helvetica. It’s a small change, but it does make the app easier on the eyes. The second, and more important, feature addition was the addition of over-the-air Notes syncing via MobileMe. The new syncing feature means the notes you see on your iPad will be the same as you see on your iPhone or iPod touch, so long as you have a MobileMe account and Notes syncing enabled. It also means that notes you create will get pushed out automatically to Mail.app in OS X. It’s this last part of the equation that needs work. Pushing Notes content to Mail is a lovely stop-gap solution, and it even lets you edit your notes on your Mac fairly easily. (Just type in a selected note in Mail’s message viewing pane, or double-click to pop out the message.) As the many Dropbox-connected plain text editors in the App Store demonstrate, users seem to want to be able to create simple documents that are automatically shared and instantly editable across all their connected devices. 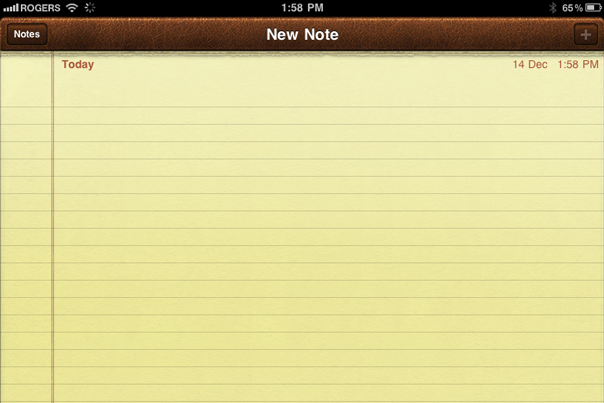 Apple’s current method of syncing notes accomplishes this, but just barely, and with considerable problems. Notes in Mail are editable, as mentioned, but if you change font or start playing with formatting you can get some very screwed up results on your iOS device. And editing in Mail’s message viewer or a modified email compose window isn’t the most enjoyable of user experiences. Here’s what I suggest as an alternative: a standalone Notes.app for OS X, and a few changes in how it works on iOS hardware. On the desktop, I’d like to see something more like the iPad/iPhone app, a standalone program that can be full-screened and provides a few more editing options. I’m fine with keeping the font choices to three, especially if it alleviates the formatting oddities that currently affect Notes. I’d love a way to change the color of the background “paper,” though, and in the iOS versions, too. Finally, as Charles recently suggested, either turn on free MobileMe for all users, or just make Notes syncing one of the features available to all users. It’s a small thing, but it could vastly improve the experience of users with both Mac and iOS devices. You could actually use it as a remote whiteboard for communicating with family members while away from home. It would act as yet another buying incentive, and one that encourages multiple device ownership. Apple might worry that a more powerful Notes would impact sales of Pages and other iOS apps, but I’m not asking for a feature-rich document editor. I just want an ever-so slightly more flexible plain text editor that automatically syncs between my Macs and iPhone/iPad. Apple’s already 98 percent of the way there, I’d just like to see Cupertino go all the way on this one. Agreed. I don’t use Mail.app and would like an independent app. What am I not getting? Notes already is a Mac App â€” it’s a feature in Apple’s Mail App and I don’t think it needs to be a standalone App. Instead, I’d like to see more integration and auto-completion of data entries between Mail, Address Book and iCal. First, I want to see hot buttons that allow quick switching between the applications. In Address Book, I want to see iCal appointments (past and future) listed in a tickler field. In Notes and iCal, I want to enter a company or person’s name and have the OS offer to add the address and phone number. In Address Book again, I want to enter a city name and have the OS automatically enter the state name and Zip Code (or vice-a-versa) in their respective fields. And in iCal, I want WYSIWYG data entry in a larger (especially a wider) Notes field. Once a wirelessly synching Notes might have mattered, but not any more. Apps like Simplenote and PlainText synch quite well via the Internet and don’t need MobileMe, free or paid. I use Notes only to track items that rarely change like clothing sizes and book lists. I’d like to see the first few apps (at least) be Mac-only. Otherwise the Mac app store would seem to be part of the iOS store. You missed the third big improvement…You don’t need MobileMe to keep your notes in sync wirelessly. Anyone can do it with nothing more than an IMAP email account. That was the killer (notes) feature of iOS 4.2.